HH205, get the next evolution of Tama's Iron Cobra hardware series at Remix Music. 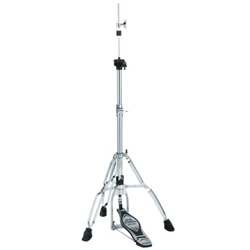 The Iron Cobra 205 Hi-Hat Stand by Tama has five different levels of tension that can be achieved quickly by using the five easily visible settings. The rubber insulator at the end of the rod prevents the rod from loosening, as well as, the noise caused by metal-to-metal contact. Since the foot pedal can be rotated around the tripod base, the swivel foot feature greatly expands floor space and set-up flexibility. Dont break your budget, get a Iron Cobra with all the venom at a great low cost. Capture one today!